Lane filtering is when you ride your motorcycle at low speed between stationary or slow moving vehicles travelling in the same direction you are. The 2 lines or lanes of traffic must both be travelling in the same direction. If one of the lines or lanes is a dedicated turning lane (left or right) you must not lane filter using this lane. A motorcycle rider is not allowed to use a bicycle lane to lane filter. To ensure pedestrian safety, lane filtering is only allowed between stationary or slow moving vehicles, not between a vehicle and the kerb. Any vehicle, including a motorcycle, may overtake to the left of a stationary vehicle. Read more about overtaking to the left. To see these rules in action, view our lane filtering video. Lane filtering is when a motorcycle rider moves between stationary or slow moving vehicles, that are moving in the same direction as the rider. Lane filtering at over 30km/h is illegal, and it's important that you only lane filter when it's safe to do so. There needs to be enough space between you and other vehicles to avoid a crash and to let you safely merge back into the traffic stream. You shouldn't lane filter near trucks or buses because large vehicles often find it hard to see you. When you're lane filtering, always look out for vulnerable road users like pedestrian and cyclists. It is illegal to lane filter in school zones during school zone hours. It's also illegal to lane filter if you're a learner or provisional motorcycle rider. Lane filtering can be a complex manoeuvre requiring plenty of on-road experience to be done safely, so only fully licensed riders are allowed to lane filter. There are heavy penalties for riders who don't follow the lane filtering rules. So make sure you're familiar with all the do's and don'ts detailed on the website. Road shoulders are the sealed area to the left or right of a road's edge line. If a variable speed control sign has been used to reduce the speed limit of a road normally 90km/h, you are permitted to edge filter. To see these rules in action, view our riding on road shoulders video. Riding on the road shoulder in Queensland. When the traffic on a road with a speed limit of 90km/h or more, such as a motorway, freeway or highway, has slowed or stopped, fully licensed motorcycle riders can, in certain conditions, move onto the shoulder of the road or into emergency stopping lanes. A road shoulder is the sealed area of road to the right or left of an edge line. Only ride on a road shoulder when it's safe to do so. You need to have enough space to avoid a crash with other vehicles and to let you safely merge back into the traffic stream. It's illegal to ride on a road shoulder at speeds over 30km/h. This could be dangerous for you and other road users. You need to have plenty of on-road experience to ride on a road shoulder safely, so only fully licensed riders can ride on road shoulders. No L or P platers allowed. It's also illegal to ride on a road shoulder on roads where the speed limit is less than 90km/h. There are heavy penalties for riders who don't follow these rules. So make sure you're familiar with all the do's and dont's detailed on the website. You must stay in control of your motorcycle at all times. You must sit with 1 leg on either side of your seat at all times when riding a motorcycle, but you can lift your leg from the footrests or raise yourself from the seat if you need to while riding. A motorcycle passenger that sits behind the rider is called a pillion passenger. hold an RE provisional or open licence and have held that licence for at least 1 year, and are riding an RE motorcycle. A passenger on a motorcycle can be a pillion passenger, or a person in a sidecar attached to the motorcycle. RE provisional or open licence, but are riding a class R motorcycle in order to learn to ride that class of vehicle. If you are learning to ride a motorcycle, your supervisor may be seated in a sidecar, if the motorcycle has one, or on another motorcycle, in a car or in another vehicle. You must also not carry a pillion passenger for the first year of holding an RE provisional or open licence. All of your passengers must wear an approved motorcycle helmet securely fastened. Pillion passengers must be at least 8 years old and their feet must be able to reach the passenger footrests while seated. You must not carry more passengers on the motorcycle or in the motorcycle's sidecar than the vehicle was designed to carry. Your passenger must be seated safely on the pillion seat or in the sidecar. Your pillion passenger must not ride on the motorcycle unless the motorcycle has a suitable pillion seat and suitable passenger footrests. Your pillion passenger must face forwards and sit with a leg on either side of the seat, but is allowed to move a leg off the footrests to stretch or raise themselves from the seat. Your passenger must not interfere with your control of the motorcycle. These rules also apply for the carrying of passengers on quad bikes and utility off-road vehicles. United Nations Economic Commission for Europe standard (UN ECE 22.05). Unless exempt, the driver and passengers of utility off-road vehicles being operated on a Queensland road or road-related area must also wear a motorcycle helmet which complies with the standards. 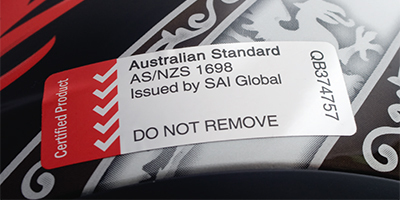 For a helmet meeting the UN ECE 22.05 standard, the label or sticker may contain any number from 1 upwards. An example is shown in the following images. There is no law that prohibits the attachment of a camera to a motorcycle helmet, as long as the helmet remains compliant with the above mentioned standards, and is an approved attachment (according to the helmet manufacturer). You may use a camera mounted on your motorcycle or a body mounted camera as an alternative. Bicycle storage areas located at traffic lights allow bicycle riders to wait in front of vehicles stopped at the intersection. They are often painted green with a white bicycle symbol. Motorcycle riders are allowed to enter bicycle storage areas as long as they give way to any vehicle that is already in the area or that is entering the area on a green or yellow traffic light or arrow. 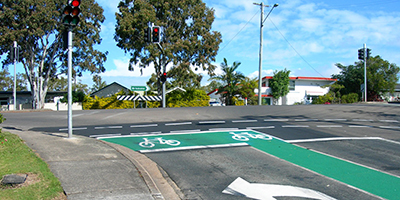 An example of an intersection with bicycle storage areas is shown below. If you break a motorcycle road rule, you may be fined and/or receive demerit points. Find tips on staying safe while riding motorcycles on Queensland's road network. Check what you need to do to get a motorcycle licence in Queensland. There are specific rules for learner riders.